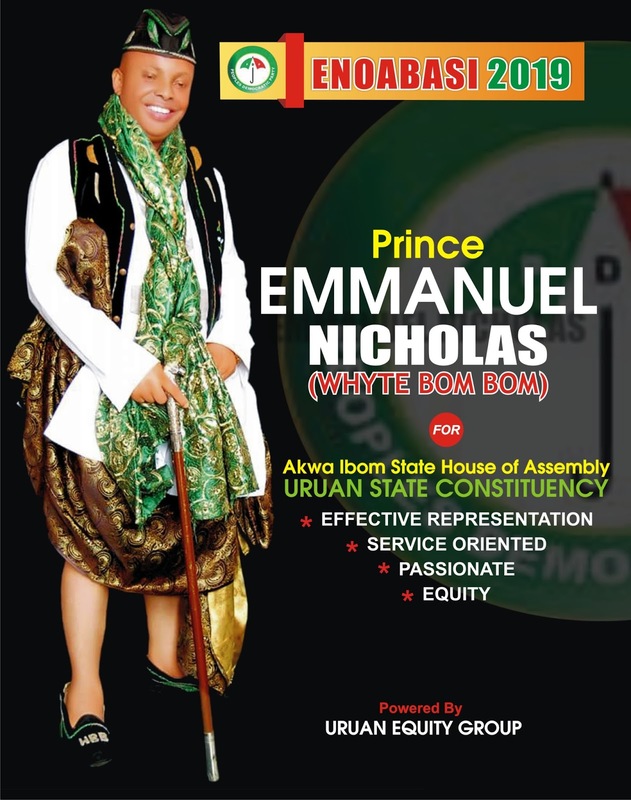 PRINCE EMMANUEL 'WHYTE BOM BOM' NICHOLAS, ENOABASI URUAN 2019. With a calibre of Prince Emmanuel 'Whyte Bom Bom' Nicholas at the State House of Assembly the future of Uruan Nation is far brighter, the entirety of Uruan people shall rejoice and experience a new dawn in legislative industrialization than envisaged by our political gladiators and self acclaimed king makers. Political stability, Inclusion, Peace, Harmony and Courageous/effective representation can only be brought to futility by Prince Emmanuel Nicholas an experienced administrator, super media expert and technocrat as our representative at the State House of Assembly who can speak for Uruan State Constituency with ostentatious audacity. There is no hesitation in joining noble minds and hands with other credible and right thinking Uruan people to network support for zoning for Central Uruan and the candidature of Whyte Bom Bom as our next representative in the 7th Assembly.